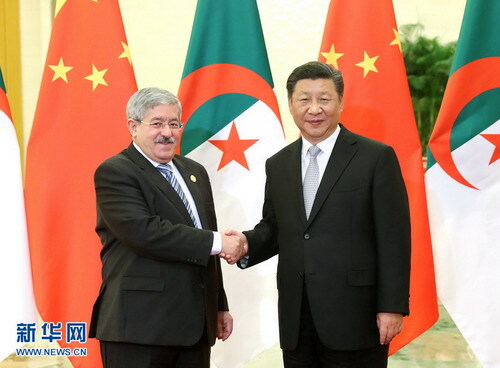 BEIJING, Sept. 5 ,Chinese President Xi Jinping on Wednesday met with Algerian Prime Minister Ahmed Ouyahia after the 2018 Beijing Summit of the Forum on China-Africa Cooperation (FOCAC) on Sept. 3-4. 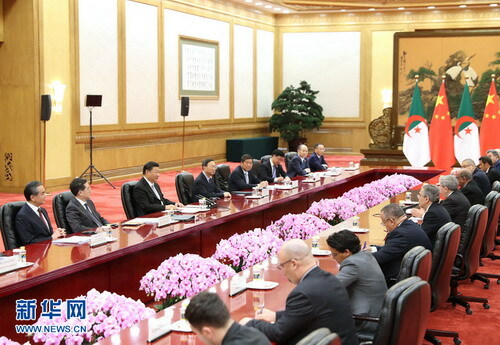 Xi asked Ouyahia to convey his cordial greetings and good wishes to Algerian President Abdelaziz Bouteflika, and thanked Algeria for its contribution to the success of the Beijing summit. Having maintained a traditional friendship that is deep and firm, China and Algeria saw rapid growth of their comprehensive strategic partnership, and fruitful cooperation in various areas, Xi said, adding that deepening the China-Algeria strategic mutual trust and coordination is in the common interests of the two countries. Noting that this year marks the 60th anniversary of the establishment of the diplomatic ties, Xi said China is willing to work with Algeria to implement the outcomes of the FOCAC Beijing Summit, and continue deepening cooperation in infrastructure and other areas under the framework of jointly building the Belt and Road. He said China will enhance cooperation with Algeria in the health sector to benefit the Algerian people. Ouyahia said he had reported the Beijing summit's achievements to President Bouteflika, who expressed congratulations to President Xi and his heartfelt gratitude to China for its support to Africa. Ouyahia said the Algeria-China relations have a time-honored history as Algeria received precious support of China during its struggle for independence and national development and the two sides have always been coordinating closely in international affairs. Ouyahia said Algeria is willing to take the signing of the Belt and Road cooperation agreements as an opportunity to deepen bilateral pragmatic cooperation.